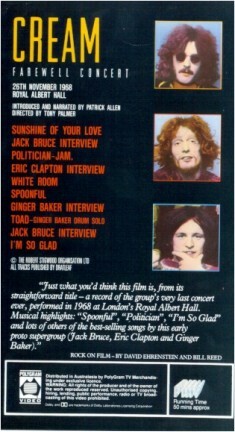 The two final concerts at the Royal Albert Hall on 26th November 1968 were video taped for a BBC documentary. It was also released on 16mm film which I saw in the early 70s. The performances are highly edited without any being complete (White Room and Spoonful coming closest). Interviews are included which date to late 67 or early 68. These are particularly interesting as they demonstrate their playing techniques. Ginger is very high and very funny when hes asked to demonstrate some flams and trips "You want me to play em, at this time of day?...Its very hard, just sittin here and doin it", and then launches into a mini solo. The sound is adequate (good bootleg) for a video of this vintage but the camera/editing is trying to be hip and is painfully annoying. Sometimes it seems the cameras are trying to video Jacks tonsils or capture every bead of sweat rolling off Ginger. There simply is not enough video of them playing their instruments. Tony Palmer must be from the school that fans are only interested in their faces rather than their fingers on the frets. All the songs start behind the commentary, however the edits emphasise the instrumental breaks rather than the vocals. Except for White Room, it is principally from the second show. However there are many annoying edits that are inserted from the first show e.g. in Spoonful Gingers shirt changes from Indian to blue than back again! It was recorded onto colour video and must have been transferred to 16mm film for later editing and adding of psychedelic effects. The video recording is the major limitation as it means that there is only one master recording not lots of film that can be reedited. Eric plays the Firebird I. From the first concert. Fades in at end of first vocal chorus and into the instrumental through to completion. The psychedelic effects appear (annoying rather than effective) and edits from the 1st concert intrude. A good performance though. Concert ends with Eric saying "
the leaders [Ginger] just collapsed, so we cant do any more." This is mainly a re-edit of the Farewell Concert video including some outakes. New additional material: the promo film for I Feel Free, private film of them on tour, photographs, Jimi Hendrix segueing from Hey Joe into Sunshine of Your Love on the Lulu show and interviews with: Buddy Guy, Robert Cray, Alex Van Halen, John Mayall, Pete Brown, Eric, Jack and Ginger. Sound quality has been improved but the only really worthwhile additions are edits of Crossroads and Sitting on Top of the World and the complete White Room. The rest are differing edits from the original and with commentary still intruding on the music. Note: Also distributed as "Best of Cream"
The complete version except for the voice over! Starts at end of 1st vocal chorus. Pretty strong performance. More instrumental and better for it! 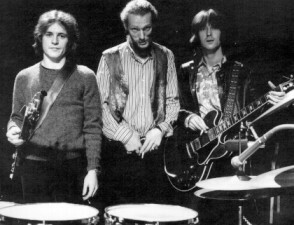 Strange Brew  miming on the "Beat Club".